All this dismissal of the Write What You Know phrase might sound hypocritical coming from such a fervent admirer and intense defender of “Shakespeare In Love”, a film which, more or less, reduced the man generally considered to be Earth’s Bard For Life down to writing what he knew. Yet in that film writing what you know took on a whole different air than the typical banality the phrase implies. The Joseph Fiennes’ version of William Shakespeare couldn’t have what his heart so desperately wanted and so he wrote what he knew in an effort to make that romantic desire real, to keep it alive once it was gone. Pollyannish perhaps, but then I’m something of a Pollyanna. 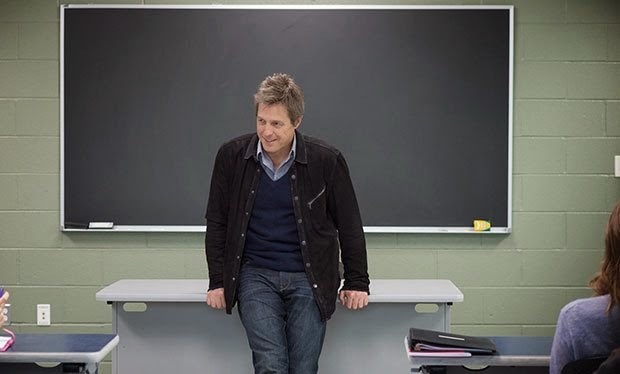 While there is sort of a Pollyanna streak to “The Rewrite” – it’s a cheesy rom com after all – it is, for all its lecturing on the concept of film writing, more or less, a case of connecting the dots. A great script can’t merely connect the dots; it needs to write in the stars. Alas, Marc Lawrence’s script only hovers barely aboveground. Keith was once an Academy Award winning screenwriter, and in one of the film's clever flourishes his entire backstory involving an ex-wife and estranged son is compressed into his whole Oscar speech, but now finds no one will buy his pitches, leaving him unable to even pay rent. As a last resort, he takes a job as professor of screenwriting at Binghamton University in upstate New York where, as an unhappy fish out of water, he’s dismissive of his surroundings and those surrounding him. He immediately sleeps with a student before he even teaches a class (a Set-Up which will yield a Payoff) and promptly puts his foot in his mouth upon meeting the faculty chair (Allison Janney), putting them at odds (one scene shows him writing Protagonist on the blackboard, so after this scene he could have written Antagonist) and demonstrating his loutishness so he can fashion a classic case of redemption. Inevitably he grows into his job, and by the end each note he gives his pupils on their classwork doubles as prophetic life advice. He’s not just a script doctor, he’s a guidance counselor. Yet in spite of my cynicism, “The Rewrite”, for all its formula, has a refreshing aversion to a few familiar traps. 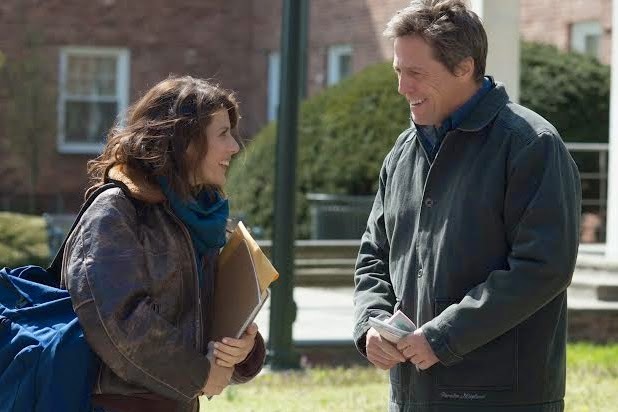 The storyline involving the obligatory primary love interest, played with her as-usual incredible smiley-face maelstrom of charm by Marisa Tomei, is not forced through patronizing hoops to ensure it has a Beginning, Middle and Happy End. At the same time, if a screenwriter is struggling to concoct an idea and is suddenly being handed all these screenplays by different pupils, what are the odds he steals one and attempts passing it off as his own? High, of course, but Lawrence admirably resists. He allows a more natural progression to play itself out in order for his protagonist to get on solid footing, emblemized in the sequence where Keith takes a student, Clem (Steven Kaplan), who has authored a particularly fine script on a meeting with some bigwig producers and graciously steps aside, self-aware enough to understand the need for his own existential edits.